At first glance, design seems superfluous—the act of decoration. What is the purpose of design? Why invest in it when there are so many DIY options available? Design is so much more than choosing colors, playing with fonts, and dropping in photos. Good design is considerate of the user— it connects and engages. Design shows the user how to interact with something, be it a printed piece, an object, a website. It influences their feelings about the interaction, and guides that user in the absorption of information: differing type sizes isolate the most important information from the (literal) fine print; color sets a mood and helps draw the eye or helps less important objects recede; white space gives the eye a place to rest before taking in more; photos create an atmosphere, etc. These visual cues serve as guideposts in the overall experience. 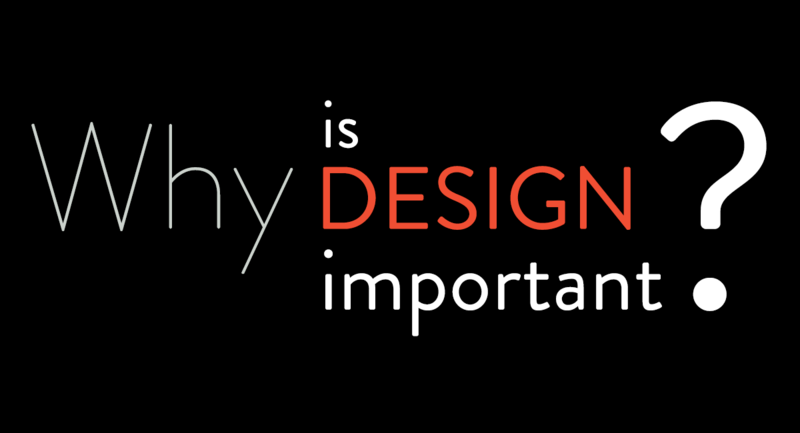 Design is so much more a part of our lives than we realize. Pick something up that’s nearby, anything. That object/piece was designed. Somebody thought (sometimes a little, sometimes a lot) about how that thing should feel, how it should look, what you needed to do with it or learn from it. And THIS is why design is so important. We all have things in our lives that have been poorly designed and are difficult to interact with. They don’t lend themselves to simple communication and understanding. They’re confusing or cumbersome and sometimes even downright enraging (I’m looking at you, coffee mug that refuses to open easily and yet leaks). And then there are the things that are designed with intention and empathy, and you barely notice your interaction with them. They just work, and you feel understood at a basic level. A step above this are the things that are so well designed that they are positively delightful. They make you happy just looking at them or interacting with them (shoutout to Asana, the app we use for project management—love you, Asana!). If you’re trying to order a product from a website that is confusing and unclear with a million different colors and text all one size, you’re going to walk away from that interaction feeling frustrated. If you manage to find your way to checkout, the product you ordered from that site will be tainted with this frustration and you’ll likely not be returning to use that site again. Your relationship with that brand is damaged. On the other hand when you have a great experience on a site that is well-branded (so you immediately connect with the brand on a visual level), with clear navigation, copy that is easy to understand, and a flow and hierarchy of information that makes sense and guides you through the process, you feel understood. You feel successful in that interaction. You develop a sense of trust in the company and in their products and you become a loyal customer. Ultimately, design is unavoidable. There is always some aspect of “design” (intentional or unintentional) in any product or service that is put into the world. You want that design to be the good kind, the kind that people connect to, because the experience of your brand as a whole rests heavily on the success of the design. And that’s a worthwhile investment. Need a new site that connects with your audience on a visual and informational level? Get in touch! We’d love to help.